Yep...I was on this flight. For full story click on link at bottom to Jerusalem Post. Boeing 777 carrying 279 passengers en route to Newark is forced to make emergency landing after technical fault found in wheel. A US-bound El Al Boeing 777 with some 270 passengers on board was forced to make an emergency landing Monday morning at Ben- Gurion Airport after a problem was found with one of its landing gear. A pilot on El Al flight 027 to Newark, New Jersey, noticed that one of the left main wheels had become jammed after takeoff late Sunday night. A state of emergency was declared at the airport due to concerns the plane would experience difficulties while landing. A state of emergency was announced at the airport overnight Sunday due to fears that the plane would experience difficulties during the landing. After the 777 circled above the Mediterranean for three hours waiting for daybreak, the pilot jettisoned fuel to avoid a possible fire upon landing. Israel Air Force jets were deployed to examine the aircraft up close and help determine the problem, but also to ensure that it was not security- related. Over 70 Magen David Adom rescue teams as well as police and fire crews were brought out, but the landing was accomplished without complications. 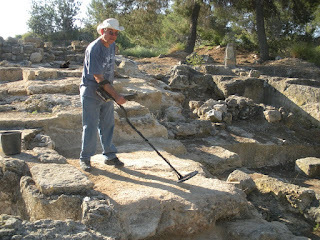 With so few coins to examine, I had lots of free time to help out in other areas of the excavation. Since I am a bit old to remain bent over digging and sweeping for 3 or 4 consecutive hours, I did not do much of that, though I did spend some time cleaning up areas of dirt where the ground was too dirty to excavate or to be seen properly in photos or drawings. But the main jobs I undertook were carrying dirt and sifting dirt. Most of the excavated dirt was sifted, but some of it was simply dumped. When we began the excavation our leaders carefully selected a dump site. Did you know that esthetics is an important consideration for good field archaeologists? 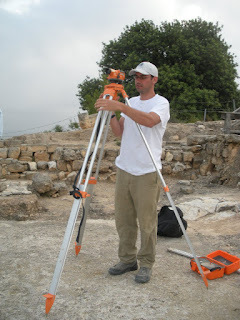 Not only do they want to make sure that excavations are thorough, well- organized, and properly recorded. They also want to be certain that the selected areas are excavated in such a way as to leave them as pleasing as possible to look at in years to come. Finally, all of the dirt that is removed must be relocated to the most innocuous possible dump site, that is carefully marked on plans so some unsuspecting archaeologist does not spend days or weeks re-excavating it in the future (an unfortunate event I am assured has occurred more than once). Keep in mind that ours was a limited excavation, with modest excavation goals. Imagine how much dirt might be moved over a 4-5 week period with more than a hundred participants. 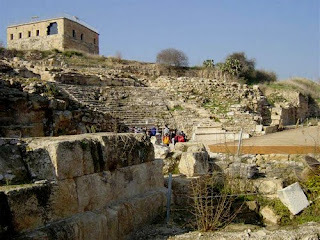 This is the last entry in the Sepphoris 2011 blog, although I will continue to use this blogspot to post some regular articles and commentary related to archaeology and ancient coins of the Holy Land. Above this post you can see a large contingent of our group at the bima, or prayer platform, at the Talmudic period (4-6 centuries CE) synagogue at Umm el Qanatir. They are: back row, from left Sean Burrus (Duke University grad student, religion), Emanuel Fiano (Duke University grad student, religion), Alan Todd (Duke University grad student, religion). Front row from left, Jessica Vahl (Duke University grad student, classical studies), Elizabeth Baltes (Duke University grad student art history and visual studies), Professor Carol Meyers (Duke University), Professor Eric Meyers (Duke University), Ben Gordon (Duke University grad student, religion), David Hendin (American Numismatic Society). Missing from this photo were Stephen Wilson (Duke University grad student, religion) who was ill, Professor Byron McCane (Wofford College) and Professor Milton Moreland (Rhodes College), both of whom stayed behind to excavate. Although we found plenty at this brief excavation season at Sepphoris, we didn't find the Lost Ark. We were not looking for it of course, but, nevertheless, the first thing that most people ask upon hearing that I have been at an excavation is: "What did you find." We definitely found satisfaction in our experience and, happily for the research, much data to justify it. I think that all 13 of us who participated in Sepphoris 2011 found a certain pleasure in getting to work at 6:15 a.m. and working (playing) in the dirt until 1:30 p.m. (Although nobody who saw any of our group working in the Galilean dust and heat would have considered it play.) Yet the banter and joking between everyone was a great part of the experience. A lot of sweat was expended by those who dug, carried, and sifted the dirt. A number of members of our group were supervisors, but even our most senior archaeologists jumped in and out of trenches and pits and carried buckets of dirt and sifted them literally every day of this brief season of probing the earth, measuring, and sketching structures in preparations for the final excavation report of this remarkable ancient city. Yesterday we had another excellent session of pottery reading with all of the important areas showing consistent pottery from appropriate periods. Noteworthy were additional significant late Iron Age fragments including large pieces of a saucer-type oil lamp and a large cooking pot of the period, again underlining our belief that there was significant settlement here during the biblical period even though no trace of actual construction from that time has yet been found. Today the sun was bright although much of the haze from previous days remains in the air. Yesterday it was overcast and the air was heavy and still, making for our hottest, sweatiest working conditions. On hindsight, however, I don't think even one of us would have traded the days at Sepphoris for time on a beach. All good things must come to an end, however, and today was the last day of our excavations. Remarkably, Milton Moreland of Rhodes College in Memphis, is leaving Israel to return home Friday night. By Sunday he will be digging and supervising at his second summer excavation in Western Tennessee, where a group of experts and students from Rhodes will be exploring ancient American Woodlands and Mississippian cultures from as long as 2,000 years ago. What a remarkable experience it must be for Milton to excavate the soil of Sepphoris, Israel, from 2,000 years ago, and within a few days to be excavating 2,000-year-old American civilizations. I hope he will write an article about the fascinating contrasts and I'll look forward to reading it. At Sepphoris Milton and Byron McCane of Wofford College in Spartanburg SC worked tirelessly together (see their photos above) to solve some mysteries regarding areas they had excavated and studied during previous seasons at Sepphoris. They dug probe trenches in some incredibly interesting areas, rich with pottery from the late Iron Age (Iron II) up to the Middle Roman Period. One of the objects they pulled from the earth may have been the most fascinating single find from our Sepphoris season. 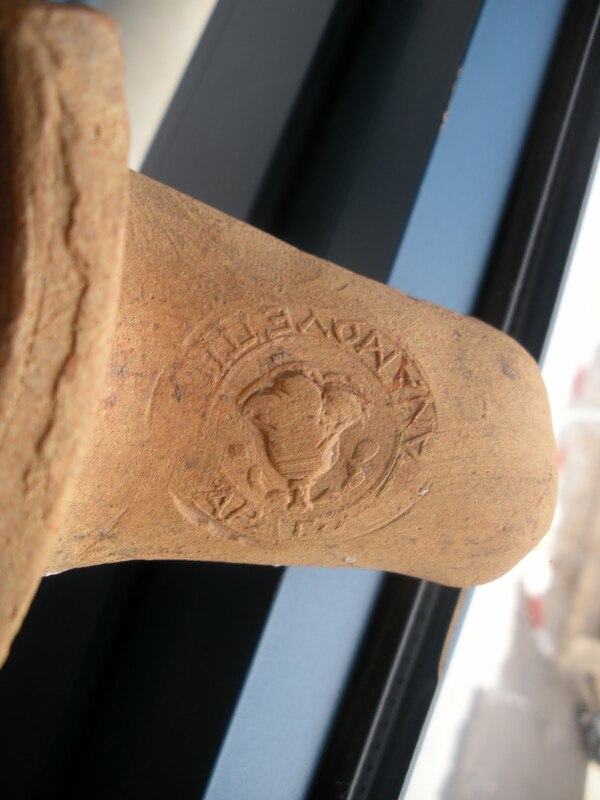 It was a Hellenistic period jar handle (circa 3-2 centuries BCE)…jar handles are generally plentiful, but what was unusual about this jar handle is that it bears a stamp showing that it originated at Rhodes. It is well known that ancient Rhodes was an exporter of both fine wine and olive oil throughout the ancient Mediterranean and it is interesting that even though both of those commodities must have also been manufactured in or near Sepphoris (as they are today), the community was wealthy enough to also import these products. The handle shows a "rose" of Rhodes, along with a Greek inscription that probably refers to the manufacturer or the exporter of the wine or oil contained in the very large amphora once attached to this handle (see handle photo above). I would like to take a moment to point out that this type of Rhodian jar handle can frequently be purchased in the legal antiquities market of Israel for a relatively small sum. And the handles themselves are fascinating. But what gives this particular handle inestimable value is the fact that it was excavated at a known location by archaeologists who are able to better understand the place where it was found because of the object itself. When even a minor object such as jar handle is removed from its archaeological context without being properly recorded, an inestimable amount of information about earlier cultures and civilizations may be lost forever. Each of us were pleased whenever we found an interesting shard or object, today I also had the pleasure of hearing our excavation supervisor Ben Gordon exclaiming to himself over another discovery: "There is nothing quite so exciting as finding a new wall," said Ben as he surveyed and traced the lines of a wall, probably from an early to middle Roman period, that had been more fully exposed and delineated on our final day of excavations (see photo of Ben doing a measurement). To look at the plan of the western acropolis of Sepphoris where we have been working for the past weeks is really remarkable. It is a huge sheet of paper with thousands of tiny, intricate lines, numbers, and other details meticulously added as notations. By getting all of this information onto a single sheet, it becomes easier for the experts to piece together plans of buildings, streets, and alleys of ancient cities. Our section of Sepphoris is a rather complicated site because it was built and rebuilt over a period of hundreds of years. Some of the houses have elements from an original house, and then elements added or modified at later dates. Sometimes water storage cisterns were capped, and new ones opened, at other times the openings to water cisterns were raised significantly to account for the new elevation of a building structure. 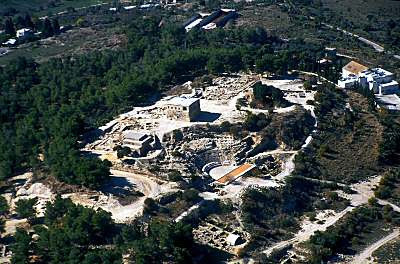 The earth still holds many mysteries of ancient Sepphoris, some of which will never be revealed, but others will come forth in future excavations. In the next blog I will tell you the fate of an archaeological numismatist at an excavation during which not many coins are found! "Sixteen miles all around Sepphoris is a land flowing with milk and honey" – Jerusalem Talmud. I don't know all about the radius, but last night it rained mud here in Sepphoris. I'm not kidding. The weather had been quite cool with some rain and a few days ago we actually had hail for a few minutes. But for a couple of days it has been overcast and on Monday night I was awakened by a heavy storm passing by. It sounded as if it was pouring rain, and I did not really know for how long. But when I woke up in the morning and went outside, the terrain was generally dry but all of the cars had mud splashed ALL over them and it was very clear that there had been so much dirt and dust in the air that when the rain came down it absorbed the dirt and literally rained mud all over the place. The windows are so muddy they will all need to be cleaned before I can drive. I don't think I have previously talked about the overall excavation site here and specifically the area on the western slope where we are digging. So here is a general overview of the western acropolis at Sepphoris a fascinating, flourishing, and largely Jewish city from the Hellenistic Period through its devastation by a massive earthquake in 363 CE. The western slope of the city contained around 5 or 6 homes (see photo above of the site taken from atop the Citadel on the top of the mound). These were generally fairly large (contrary to what I wrote about "small homes" a few days ago) Roman style homes that surrounded a central courtyard. It is a bit difficult to ascertain the exact nature of each dwelling, but they appear to have belonged to prosperous families. Each of the homes seems to have several stages of building, in which initial structures were modified and expanded as time passed. There are MANY underground storage areas and water cisterns that honeycomb the entire area under this portion of Sepphoris. Many of them have clear hard basalt well-heads (see photo below) that made it convenient for people to raise and lower water jugs to be lowered into them to draw water. Jewish ritual baths, called "mikvahs" (mikvahot in Hebrew) literally dot the entire area, and often homes have 3 or even four mikvahs in a single house. It seems that they were not necessarily used simultaneously, and when one became filled with silt or otherwise unusable, another would be built. The Jewish mikvah has certain ritual requirements, one of which is a source of fresh, running water into it. The mikvahs here in Sephoris are neatly made plastered installations, sometimes carved out of the bedrock, and at other times built independently. Their very presence in this city gives a very Jewish identity to the city. 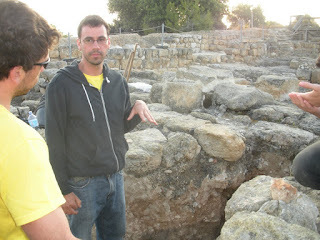 (see photo of Eric Meyers below pointing out mikvah, a plastered pool with steps, alongside a water storage pool on left). 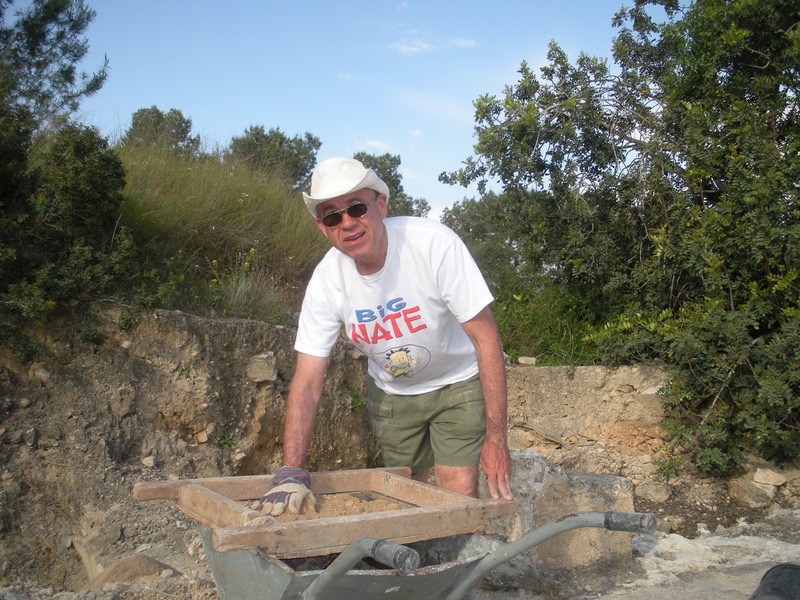 While we have found only around eight coins here during our brief (2 week) excavation (see photo of me below using metal detector and NOT finding coins…. ), the coins struck in Sepphoris very much help tell a part of the story of the city. For reasons we do not fully understand, the people of Sepphoris decided not to participate in the Jewish War against Rome which began in 66 CE and mainly ended in 70 CE when the Jerusalem Temple was destroyed. (Actually the war continued until 73 CE when Masada fell to the Roman legions.) In deciding not to participate in this war, the people of Sepphoris were not necessarily being traitorous to the Jewish cause. In Jerusalem there were both "pro peace" and "pro war" parties. Prominent members of the "pro peace" parties were King Agrippa II, great grandson of Herod the Great, who pleaded with his fellow Jews not to enter into war against Rome, since they would surely be defeated. Another "peacenick" of the time was Rabbi Yochanan ben Zakkai, who is best known as the founder of the Academy of Jewish learning established at Yavne, in the north, after the Temple was destroyed. 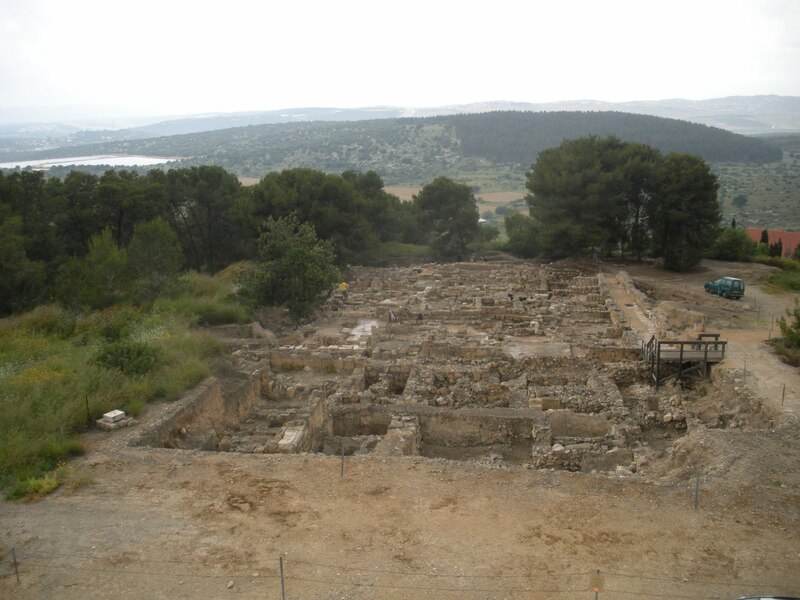 This academy at Yavne was the origination point of Rabbinic Judaism in which the daily Temple sacrifice was replaced by daily prayer, and the earthly Jerusalem was replaced by the heavenly Jerusalem. Rabbinic Judaism was adoptive in nature, and many argue it was a central force in allowing Judaism to survive and thrive until today. At any rate, Nero (54-58 CE) rewarded the people of Sepphoris, by allowing them to mint coins (possibly under the direction of Agrippa II who had not yet become king, but was a governor in the area)—and these coins named Sepphoris as "Irenopolis" or "City of Peace." Later, under the emperor Trajan (98-117 CE), coins were minted in Sepphoris with one side showing the portrait of the emperor and the other side carrying the name of the city. These coins were also unique in that they did not show the usual mythological characters or pagen gods presented on the local coinage of other cities. Instead the wreath, palm tree, ears of grain, and other symbols not offensive to the Jewish population were depicted. Later Sepphoris was named "Diocaesarea" (City of Zeus) on its coins and a Temple to Zeus was shown on coins of Antoninus Pius (138-161 CE). Within the next century, remarkable coins struck under Caracalla (197-218 CE) and Elagabalus (218-222 CE) talk of a special treaty between the sacred council of Sepphoris and the sacred Senate of Rome. These coins seem to reflect a notation in the Talmud that refers to a special relationship between a Roman Emperor named Antoninus (part of Caracalla's Latin name) and the senate of Rome. In case any of you think this stuff is boring, check out the photo below of our colleague Emanuel, a Duke graduate student in religion. 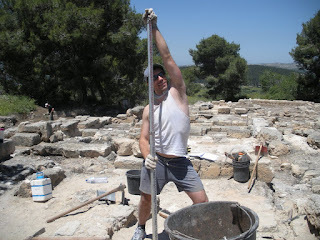 As you can see, he has become demonstrably excited by the Sepphoris excavations. Among the reasons for his jubilant mood may well be Elizabeth Baltes, a Duke grad student in art history, and Jessica Vahl, a Duke grad student in classical studies shown hard at work in one of the areas they excavated. 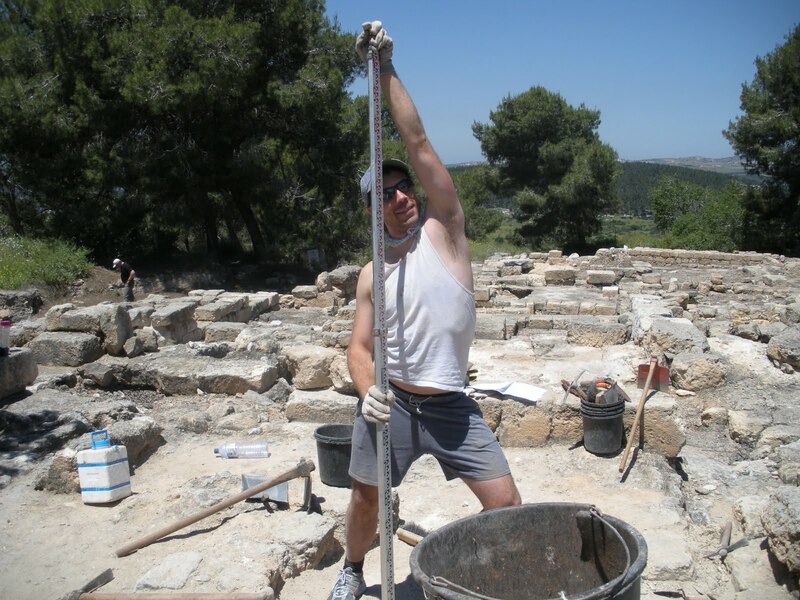 TUNE IN tomorrow……..for the amazing Sepphoris water reservoir and the only one of the many synagogues of Sepphoris that has been discovered so far….and more of the inside stories on the excavators of Sepphoris 2011...what will Sean wear? The beginning of our second and final week of this brief Sepphoris excavation was not very eventful in the field, although we moved a heck of a lot of dirt. My guess is that we removed and sifted around 100 buckets of dirt, maybe a few more. 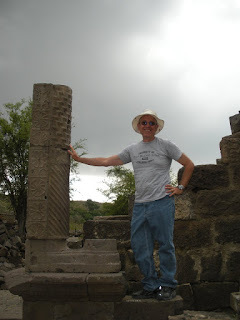 Principal work this season is to better identify the chronology of certain areas in the ancient city where Eric and Carol Meyers have been excavating with their students since 1993. 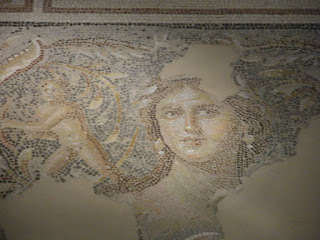 (They have excavated at Sepphoris since 1985 in other areas, and in fact in 1986/7 discovered the famous Dionysus mosaic with the lovely face that the media dubbed the "Mona Lisa of the Galilee," which is on display here at the site…her face at the very top of this blog site.) In order to do this the senior archaeologists have identified areas for probes and these are the specific areas that are being dug. The Rabbis who wrote the Talmud described the air of Sepphoris as "salubrious" and that certainly was true today. Although we had some real heat, probably around 85 F around noon, by the mid-afternoon when we left the site, we were starting to get a lovely breeze. We reconvened at 4 pm for pottery reading. This is one of my favorite parts of the excavation, and here is how it works. The excavation is divided into areas. Each area is divided into "loci" (singular = locus) that are unique three dimensional areas that are physically independent from other areas. Sometimes the separation is due to a plaster floor, a wall, a collapse layer, a fill layer, or even an ash layer from a fire long ago. 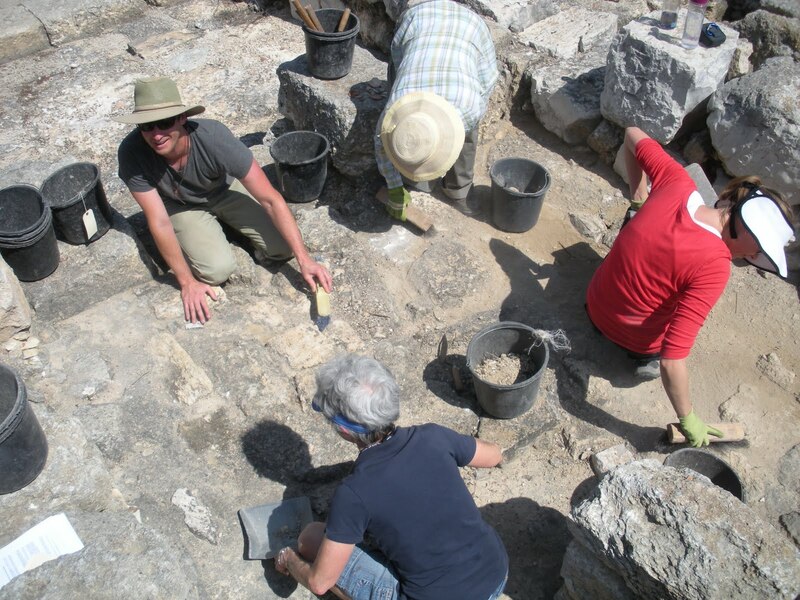 Although the earliest occupation of Sepphoris is still a shrouded in mystery, the pottery shards indicate that there was occupation at this site certainly in the early Iron Age (circa 900) BCE and through the Persian Period (4th century BCE). The housing units here range from the Hellenistic through the Roman Periods, and during this time Sepphoris was certainly a Jewish town. (Bones of fish, poultry, and sheep/goats have been found in these areas but no bones of swine. Also a number of Jewish inscriptions and menorah images have been found here.) In the 2 century CE the Mishnah was compiled and edited here by Rabbi Yehudah ha Nasi, and in the 3 – 4 centuries much of the Talmud was compiled and edited at Sepphoris. The Jewish nature of the city seems to have ended at the time of an earthquake of 363 CE, of which we see evidence everywhere at the site, with buildings damaged severely in many cases. As each locus is excavated (see photo above of 4 colleagues working on one locus), the dirt that is removed is sifted (much of it by this grimy scribe). 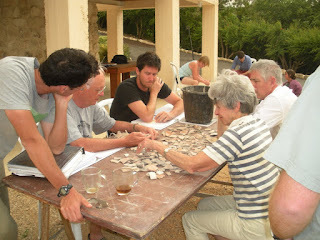 During the sifting process we remove identifiable shards of pottery, artifacts, coins, and even animal bones. The pottery goes into a bucket that is labeled to the number of the locus, and the coins, bones, and other artifacts go into specially labeled plastic bags. Each day we bring the pottery buckets back to our camp, and the pottery is immersed in water, and scrubbed with fingernail brushes to remove all dirt that adheres to it. The shards are then dried in the sun. 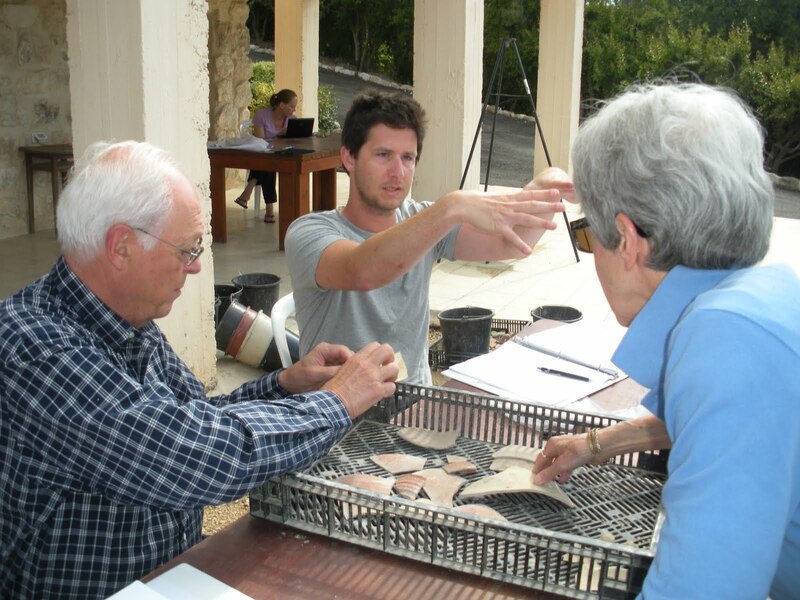 Every few days the ceramics expert, in our case it is Eric Meyers, who has more than 40 years of experience "reading" and identifying shards, sits at a large table overlooking the gorgeous view of the Galilee, and the pottery from each locus is dumped on the table (see photo above). 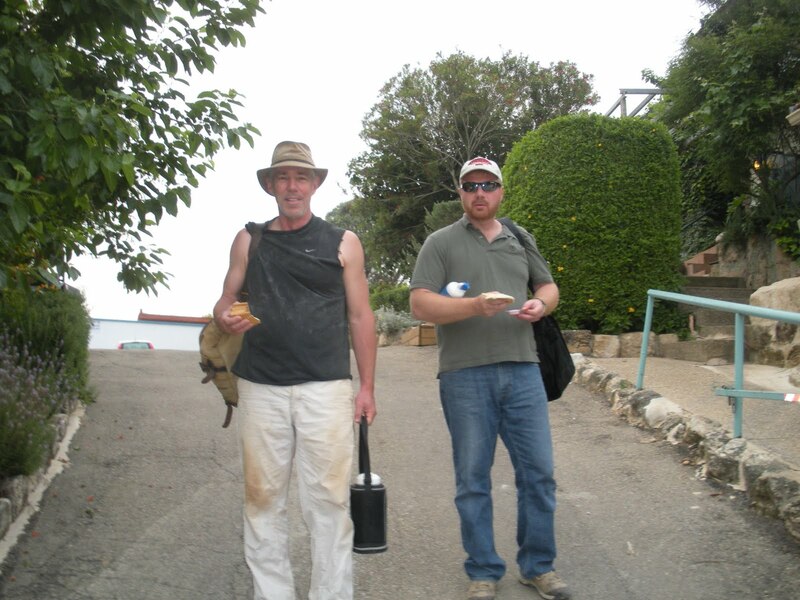 The graduate student/archaeologist responsible for the locus sits alongside him and we help spread out the pottery fragments. The most valuable pottery fragments for identification are those that contain rims and lips of pottery, since the body "shards" are often too similar to identify. Eric quickly picks out the identifiable fragments….today we had quite a few Iron Age fragments; two interesting large pieces of "Attic" black-glazed pottery, one with painted floral motif; lots of Hellenistic, Early Roman, Middle Roman, Late Roman and Byzantine, as well as later Islamic fragments which went as late as the 8-9th centuries CE. Since today was the first day we did not find a single coin in the field (although the metal detector warned us that this would likely be the case), the pottery reading was fascinating as always, and it was especially neat to find the Iron Age and Attic ware pottery here. We also found a fragment of an unusual oil lamp, probably 2 – 3 century Roman, but of an exact type not familiar us. We are gathering other opinions. We also had a bit of excitement…during the pottery reading one of the Ph.D. students, Alan Todd (sitting with Eric in photo of pottery reading), was working at his computer. Suddenly he jumped up and shouted, and we realized that a snake had somehow crawled into his lap and, needless to say, startled him. Said snake wound his way across the patio in and out of bins of pottery shards drying in the sun….with people jumping out of its way. Another of the Ph.D. students, macho Sean Buras, picked it up by the tail and threw it into the garden. Yes, that is what counted as big excitement today in Sepphoris! It's now Sunday evening and today was our day off. I drove to Tel Aviv to visit old friends and met my brother Ron and his wife Terry for lunch. Now, back at Zippori Village I learn that 8 of my 12 colleagues are down with colds, flu, or food poisoning. Hope they will be fine tomorrow, because only a week remaining for this excavation, and quite a bit to do. It's been a couple of days since I wrote, so here's a report on Friday and Saturday. Friday's excavation work was mostly uneventful because we had storms on and off through the morning, which even included pellet-sized hail for a few minutes. The rain came and went and in general was not wet enough to disrupt the work, but the icy wind whipping across the hill combined with the thunder and lightning meant that we were going to be safer indoors during those periods. So we got to the nearest shelter which was the mostly Crusader fortress on the crown of Sepphoris. The areas we dug on Friday before the lightning chased us away were mostly late Roman from the fourth century, as proven by a small bronze coin of Constantius II (Roman Emperor from 337 to 361— second son of Constantine I and Fausta), proudly discovered by Elizabeth while she was excavating. Usually coins are found in the sifting process and it takes a sharp eye indeed to find a small (15 mm) bronze coin during digging. Elizabeth is a graduate student in art history, so she was up to the task. Friday evening I was invited to Shabbat dinner at the home of my long-time friend and excellent numismatist Ronen Bachar, who lives in Beit Shean, about an hour from here. It was an easy drive thanks to the clever GPS I am using. Ronen's wife Miri cooked course after course of fish, chicken, and maybe a dozen side dishes. Their five lovely daughters, who range from around 6 to 17 joined us and it was a great Israeli Shabbat. 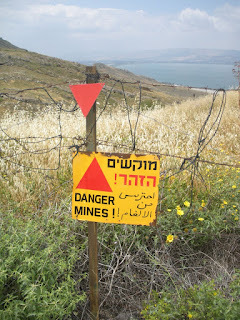 Saturday was a travel day for our group and 10 of us headed to the Golan Heights by way of the Sea of Galilee to explore some familiar spots and some that I had never seen before. It is always amazing to visit these historic spots, but to travel in a car with Eric and Carol Meyers and benefit from their commentary, as well as the fantastic knowledge of the graduate students, is a wonderful experience. The senior graduate student and excavation supervisor Ben Gordon (first photo) has years of excavation experience here in Israel and has a broad and deep knowledge of the sites. 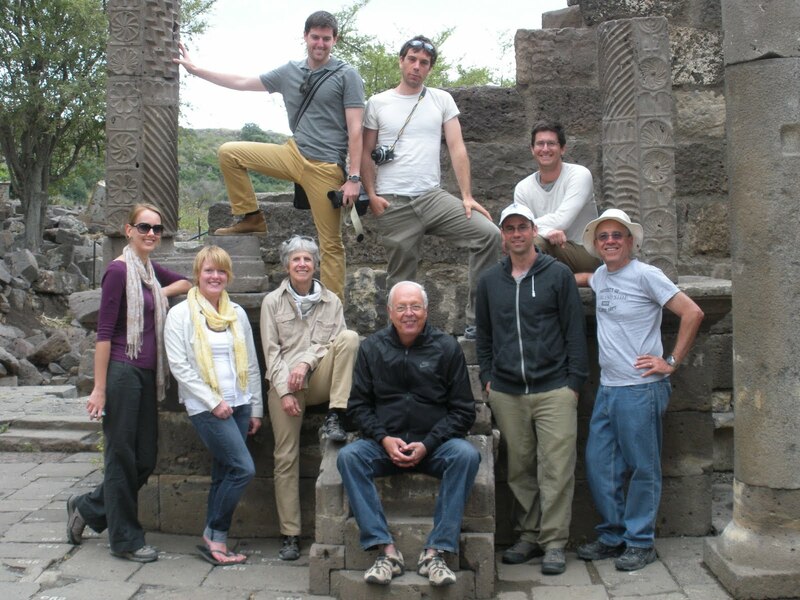 Near the Sea of Galilee we visited the ancient synagogue and church at Capernaum and the reconstructed ancient church at Tabgha. Capernaum was a village on the northern shore of the water, and excavations have found two ancient synagogues, one on top of the other, dating to the third to fifth centuries CE. An octagonal house dated to the first century CE is traditionally said to be the home of St. Peter, and a modern church is built atop it. Nearby Tabgha is the site of the Church of the Multiplication, where it is believed that Jesus provided food for 5,000 people with five loaves of bread and two fish. A 4 – 5 century Church was excavated and reconstructed here, with the original mosaic floor. The principal feature of this floor is a mosaic of two fish and a loaf of bread. This portion of the mosaic was built adjacent to a jutting large stone, and some believe that the builders of this church believed that this was the rock upon which Jesus stood when he blessed the food just before feeding the crowd which gathered to hear him speak. Hippos, also called Sussita, is a site perched high on a hill overlooking the Sea of Galilee. 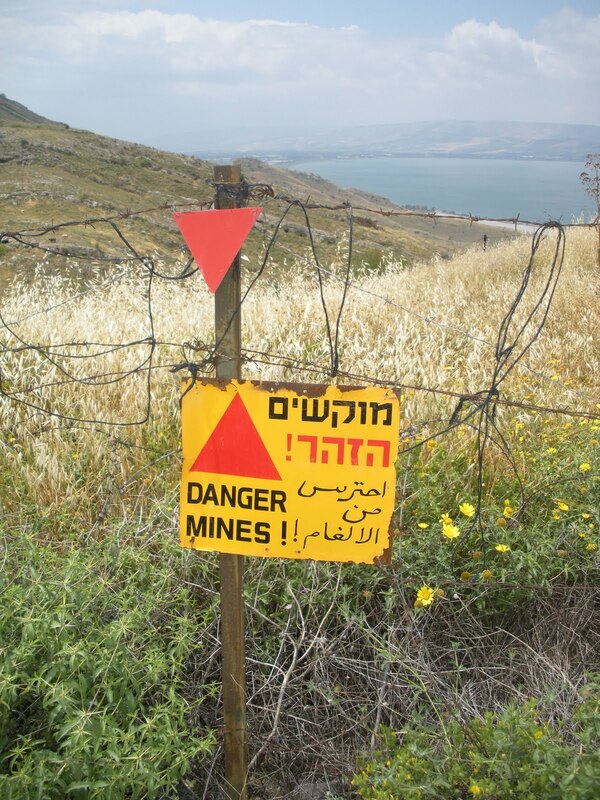 It was formerly Syrian territory until 1967, and there are still old signs warning against walking into the minefields strung around the place (second photo). This rainy season has brought out amazingly beautiful wildflowers in dozens of colors, and the hills are beautiful. It was about a 40 minute climb up to the city at Hippos, which was a part of the Decapolis, a league of ten Greek cities in this area in Roman times. There are wonderful ruins here of several churches from the Byzantine period, and two of them still have their reliquary areas where relics of saints would have been stored. I had never been to Umm el Qanatir which is an amazing synagogue from the Talmudic period—from around the 4 – 6 centuries CE. The synagogue is being simultaneously excavated and carefully restored in a high-tech excavation in which I was told that the archaeologists are using a laser to scan the ruins. Then specially created software creates three dimensional computer images, and each stone is implanted with a microchip so each of traits, including original placement can be determined. A huge crane lifts the black basalt stones in place. It is estimated that the original walls of this synagogue were more than five meters (at least 30 feet) high. The synagogue has a platform ("bima") for prayer and a torah shrine which is flanked by carvings of Jewish menorahs flanked by incense shovels, lulavs and etrogs (third photo). It is believed that the people who lived in the nearby city processed linen, a very prosperous business in the ancient world according to the Talmud. Tomorrow, back to the dirt. Today I sifted dirt; shoveled dirt; scooped dirt; pushed dirt; dug holes in dirt, and cleaned up the dirt from the surface of the dirt. If I can figure out how to do it I will attach photos of the sifting and the cleaning (sweeping) of the dirt. As you can see I was accompanied in today’s adventure by Big Nate himself, who is preparing for his Hebrew debut and so I thought to provide him with some local exposure. Today we had some visiting scholars, one was Stuart Miller from the University of Connecticut who has been here in Israel on a Sabbatical for a few months. 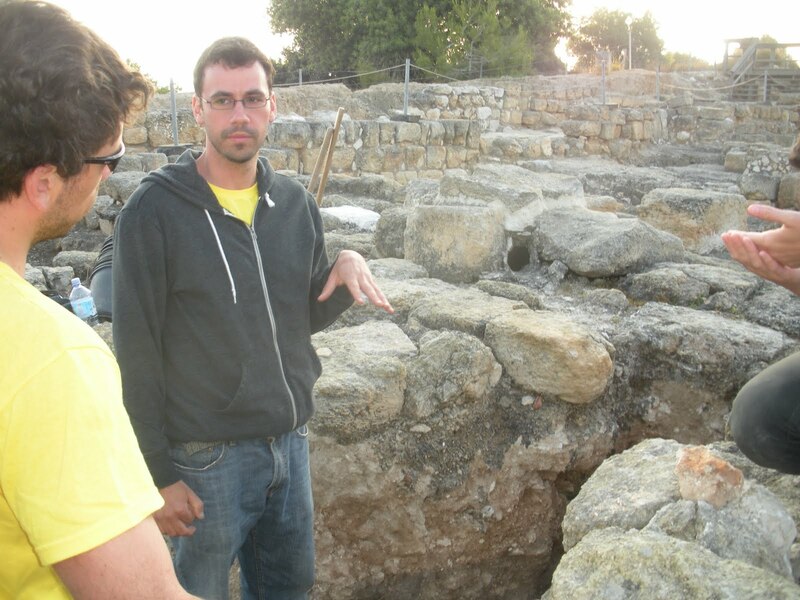 He is an expert in ritual pools, called “mikvot” (singular “mikvah”) in ancient times. The excavations at Sepphoris over the past 25 years have been unique in many respects, but one aspect is that very large numbers of ritual pools, step pools, and/or mikvot have been revealed…..more than any other site in Israel. 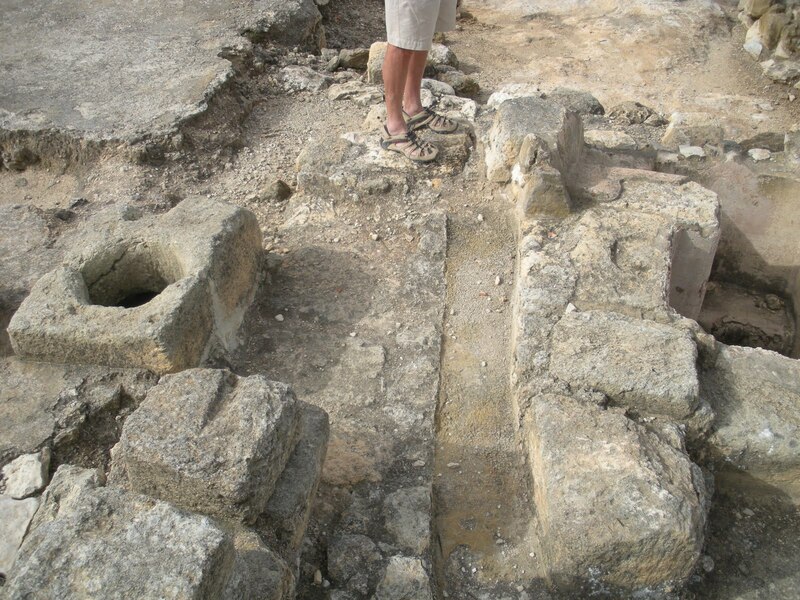 Some are probably public ritual baths, but here in Sepphoris there were also many that seem to be from single dwellings. Back in 1985 when Ben, Sarah, Jeannie, and I excavated here, Ben excavated many mikvot because he was usually the only person small enough to enter them through the initial excavation holes. Ben, Sarah, and Jeannie will be especially interested that I spent part of today with several people studying the various mikvot, and most of that time was spent in the very pits that we dug originally in 1985. As Ben noted last January they were rather in disrepair from a lot of rain wash, but we cleaned up, measured and photographed some of them for the ongoing studies. We are preparing to open a new large probe area tomorrow, and today the area around it needed to be “cleaned up.” So, you may ask, why do we need to “clean up” the dirt? A scientific archaeological excavation is like a sterile laboratory procedure. One must not allow contamination of a fresh “locus” or area of study with extraneous material. Thus before a new locus is opened, the entire area around it must be cleaned of shards, earth, etc. that might contaminate our understanding of it. Today during the removal of earth from around this area, one of the students discovered a coin of Claudius II Gothicus, 268-270 CE, which I was able to clean enough in the field to identify. It has the emperor’s face on one side and on the other side it shows Neptune standing holding a trident and a dolphin. This was a Roman coin brought to Sepphoris at a time when there was a large Roman population here. We had a lovely vegetarian dinner at a nearby small café which has a small company that manufactures superb quality olive oil from local olives. Nice place, nice people, interesting conversations. hi everyone. there is no doubt that today i carried way too many heavy stones and buckets of dirt. my bones tell me it is time for rest. we did exploratory probes in three specific areas today. as i think i have mentioned, eric and carol meyers have been excavating here at sepphoris since 1985. by some coincidence i was here with them that season for i think five or six weeks, together with ben (then 10) and sarah (then 13), and jeannie joined us for a couple of weeks. at that time it was a big and dirty hill with an old building atop it. now the building (oldest parts date to roman times, but mostly crusader (shown in picture)....) is a m useum, and several parts of ancient cities have been exposed. eric and carol and their graduate students are preparing the excavation material since 1995 for publication and there are a number of stratigraphic/chronological questions that needed to be revisited, along with verifications of measurements, elevations. etc. sepphoris was a very important city in the ancient world. rabbi yehudah ha'nasi, editor of the talmud, lived here for the final 17 years of his life and much of the editing took place here. also this was the original capital of herod the great's son antipas. finally, since jesus grew up so nearby in nazareth, he probably construction work during the building of this city and he may have been exposed to greek theatre here...there is a first century amphitheater here that was excavated in the early 1900s by the university of michigan (shown in picture). today we removed an area of a cobble-stone floor--pretty big stones--about a meter square. this was thought to have been built in the late roman or byzantine period and we were examining the dirt under the floor to see what it might reveal. after sifting 20 or so buckets of dirt, revealing very few identifiable potshards, i spotted a large silver coin from the umayyad period, around 630 AD. this discovery has altered the dating of this particular structure, pushing it later than previously thought, since the floor must have been laid some time after the coin found its way into the deposit. in another area, thought to date to around 1st century BCE to 1st century CE we found another coin which was quite encrusted but almost certainly a coin minted in ashkelon in that exact date range. the weather here is remarkably mild and it was actually cool in the shade when we took our 11 am break, although it was quite hot in the sun. right now it's probably 50 degrees (sun has set) and downright chilly. today was israel independence today and there were busloads of tourists walking around the park and exclaiming about the "real" archaeologists they saw huffing and puffing with the stones. here is another interesting note about field archaeology. it is very definitely NOT a treasure hunt. for example, there was one area of a floor that was being considered as a possible area to explore. the metal detector (which has been quite accurate) indicated at least six coins or similar bronze objects within five to six inches of the surface. but because of the overall layout and understanding of the site, it was decided it was not necessary to disturb that area. one part of modern archaeological method is whenever possible to leave in place some , for future study. tomorrow we will work in the morning and take a field trip to beit shean, the ancient nysa-scythopolis, in the afternoon. jeannie, zinger, ali, ben, chrissy, and i all visited the site on our recent visit, so it is fresh in mind, but it is a huge and interesting ruin and i look forward to seeing it again. hi eveyone. this is to family and few friends who expressed interest in what i am up to here at sepphoris. i wrote a short report yesterday, but not to everyone. just to catch you up...the young lady who lost her passport found it amongst her belongings so that story also ended well. the fellows stranded in the car with the flat tire got here late but safely. we are down one graduate student who came down with strep infection just before leaving duke. we are expecting a few more professors from other colleges who will stay for the duration, and a number of scholars either israeli or working in israel on related topics, who will drop in for a day or so here and there. last night we all had a nice but simple dinner at an arab restaurant in nazareth, which is 6 km southwest of here. our accommodations are at the guest cottages at sepphoris (zippori) which is part of a moshav here, where there is some dairy, wine making and a few other things. they are simple but pleasant. the internet connection is weak and occasional but it works well when i sit outside.today was our first day of excavating. we had a merciful reprieve from the usual 5 am start in the field, because the weather here in the galilee has been unseasonably cool and there is quite a lot of dew in the morning. so we started today at 6:30 to give it a chance to dry off. we are working in an area of small homes from the roman to early roman period. 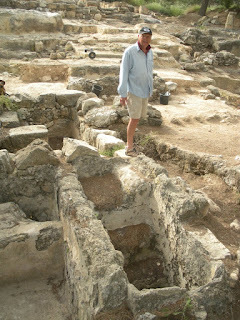 eric and carol meyers have been excavating at sepphoris since 1985 and they are doing some measurements and work to finalize some of their latest work...mostly that done since 1995...and preparing it for publication. 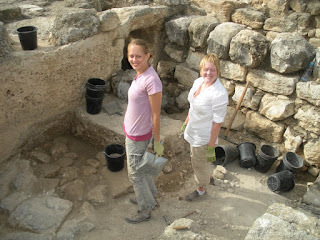 today we excavated the corner of a room that had previously partly excavated. it was most certainly a kitchen and there was already exposed a "taboon" oven in one corner of the room. there was another area on the room that had been plastered over, possibly in late roman times, and not previously excavated. this is the kind of thing that the archaeologists love because it has been sealed in since it was made, and the material found inside helps date things accurately. i swept the area with my metal detector before digging, and received readings that there were three or four bronze objects in the area. 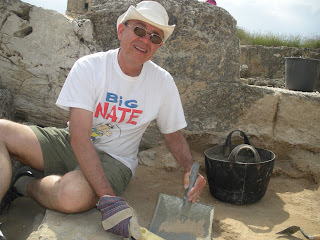 it took us from 6:30 to 1:30 (half hour for lunch) to excavate the area which was about 4 x 5 feet by 15 inches deep. under the plaster we found a layer of burnt wood, possibly from cooking fires, and possi bly from destruction. we also found a lot of animal bones and my undergraduate zoology major came in handy, since i was able to identify the bones of small birds (possibly chickens), sheep/goats, cow, and also at least two different fish. we also found shards from a number of cooking style pots, and pieces of glass, that dated from late hellenistic to early roman.....and one or two from the iron age, much earlier and probably used as fill.......we found one bone implement, probably used for weaving, and a stone that was probably a grinder or pounding stone. the metal detector was spot on. we found one metal object...probably a handle or box decoration in the shape of a lily flower, hellenistic or roman but age uncertain....and three coins. one was totally not identifiable. one was a bronze coin of herod the great and the second was a jewish bronze coin from the maccabees or herod, which i could not identify without further cleaning, but the shape was specific. it got warm earlier, but i am sitting in the yard here now and the sky is blue and there is a nice breeze. meeting at 4...gotta go.